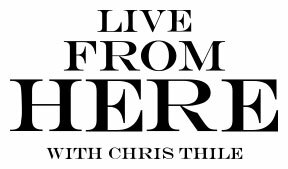 Live from Here is a musical and comedy variety show, hosted by musician and songwriter Chris Thile, heard by 2.6 million listeners each week. Chris’ captivation with the mandolin began when he was a toddler in Oceanside, California. At age eight, he formed Nickel Creek with Sara and Sean Watkins. The genre-bending trio would go on to sell millions of albums and garner a boatload of honors, including a Grammy and a couple of IBMA Awards. In 2007, Nickel Creek called an “indefinite hiatus,” although they reunited in 2014 and released A Dotted Line (Nonesuch Records). Chris has collaborated with a who’s who of musicians, including Edgar Meyer, Stuart Duncan and Yo-Yo Ma. In 2006, Chris formed Punch Brothers, with Chris Eldridge (guitar), Paul Kowert (bass), Noam Pikelny (banjo) and Gabe Witcher (fiddle). The group’s recordings include Grammy-nominated The Phosphorescent Blues and a new five-track EP, The Wireless. Chris is married to actress Claire Coffee. The two, along with their young son, Calvin, make their home in Brooklyn, New York. Listen to Live From Here with Chris Thile Sundays at 9am on KXT 91.7.